KENNEDY SPACE CENTER, Fla. - As the space shuttle Discovery dives through re-entry to end STS-119, the aerodynamic flow on its outer left wing will be deliberately tripped from laminar to turbulent flow at Mach 15. This is much earlier than at Mach 11 when this area of the aft wing would normally go turbulent during the re-entry. The early shift to turbulent flow will send temperatures on that area of the wing soaring to 2,200 deg. 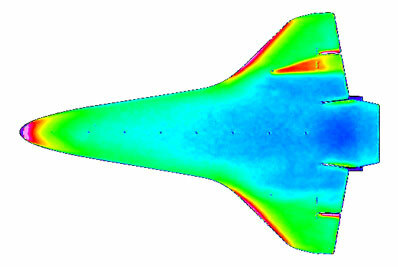 F.
In comparison, a smooth shuttle wing should be generating no more than 1,600-1,700 deg. F airflow had the wing stayed laminar until Mach 11. 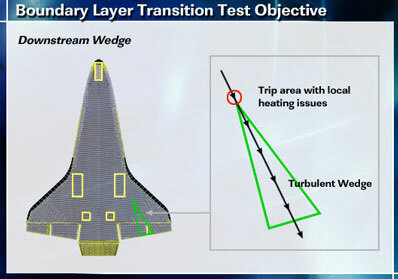 The objective on STS-119 and the remaining one or two flights of Discovery will be to intensively document the characteristics of how the airflow is tripped from laminar to turbulent, generating the potentially dangerous increase in heating which could damage the orbiter, according to Chuck H. Campbell, Johnson Space Center Principal Investigator for the Orbiter Boundary Layer Transition Flight Experiment. The airflow will be deliberately tripped by a four-inch wide and quarter-inch tall "speed bump" built into a test tile surrounded at various distances by about 10 tiles instrumented to document temperature changes. The speed bump fence is secured into BRI-18, a robust tile with added densification atop. Over the 30-year history of the shuttle program, protruding gap fillers have caused such early boundary layer transitions on the wing about a dozen times. These were unknown to the crew or Mission Control until charred tile areas, sometimes accompanied by gap filler evidence, was found on the runway at Kennedy or Edwards AFB, Calif.
Columbia and her crew was lost in 2003 because of external tank debris damaged her wing. This was followed by the STS-114 return-to-flight mission where a protruding gap filler was removed during an emergency extravehicular activity (EVA) because of concerns about the unknowns of increased belly heating caused by the protuberance. The test has been supported by wind tunnel and analytical testing before the launch of STS-119. And during the re-entry an attempt will be made to have the U.S. Navy's Cast-Glance Infrared Optical sensor mounted on a P-3 Orion to intersect the descending shuttle for high-speed infrared imagery of the hotter than normal footprint. The success of the exercise will depend in part upon whether the orbiter flies a re-entry track that can be underflown by the Navy P-3. On the subsequent STS-128, the plan is for Discovery to carry a somewhat taller speed bump that will further broaden the science base. The Orion Crew Exploration Vehicle program is helping to provide advocacy for the BRI-18 test because of plans to use that more-robust tile on Orion. Advancements of any sort are welcomed because many aspects of this problem will still yield significantly to focused inquiry, according to an Air Force/NASA paper on the project authored by Campbell. "Because the problem of hypersonic BLT is so complex, the infrastructure requirements are also significant. This is true whether ground based experiments, high fidelity computations, instrumentation techniques or flight testing are the subject of interest. For this reason and others, effective and strategic use of infrastructure is a very important consideration. "Launch vehicles and launch systems involve infrastructure that require large investments and many technology requirements. From the standpoint of economics and infrastructure investment, opportunity cost is often used to describe the costs associated with being able to accomplish an activity. The opportunity cost of having a launch system such as the space shuttle is high. "Great accomplishments have been made by utilizing the shuttle to advance the state of the art in many technical and scientific areas - from astronomy, to liquid rocket propulsion systems, to reusable launch systems, etc. Therefore, in this context great accomplishments require significant infrastructure," Campbell says. 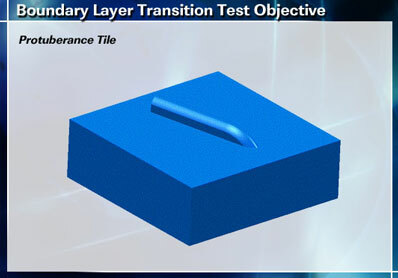 Following the STS-119 tests, the BRI-18 speed bump and associated tiles will be pulled from Discovery and shipped to NASA Langley for runs in Langley's Mach 6 and Mach 10 wind tunnels. It will also be shipped to Buffalo, N.Y., for testing in the Calspa/Cubic shock tunnel.